Apple doesn’t release new products very often, but when it does, people pay attention. In fact, it’s probably safe to say that the gadget gurus at Sony were taking notes. The Japanese company just announced two products that could safely be called ripoffs of Apple’s newest products: a slick set of wireless earbuds and a smart home speaker. Let’s start with ripoff number one: the new Sony WF-1000X earbuds. These “completely wireless” earbuds look a lot like Apple’s AirPods, at least in terms of what they do. The brand new Sony earbuds come in a portable charging case, just like the AirPods. They feature microphones for taking calls, just like the AirPods. They even have a one-touch button that lets you control playback and beckon an artificially intelligent assistant like Siri, just like the AirPods. However, the Sony wireless earbuds also come with noise cancellation, a feature not available on the AirPods. They will cost $200 when they come out in September, though. The AirPods are $160. Now, on to the Sony LF-S50G. This smart wireless speaker looks almost identical to Apple’s HomePod. The Sony speaker also offers voice control, just like the HomePod, as well as high quality 360-degree sound, just like the HomePod. 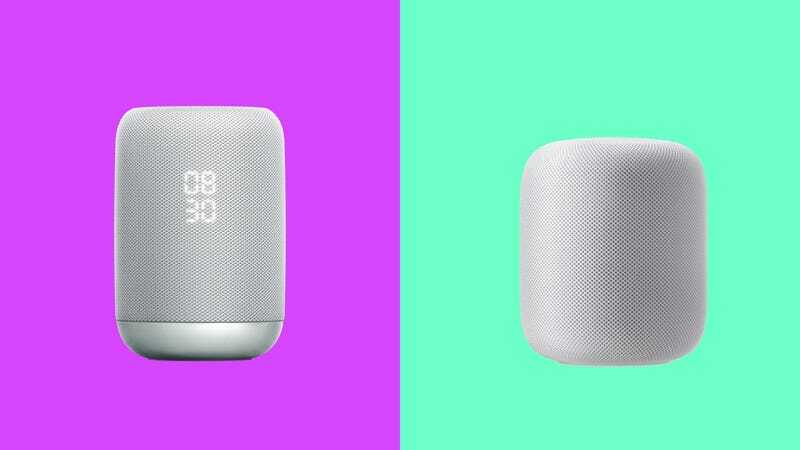 Unlike the HomePod, the Sony smart speaker connects to devices using Bluetooth and NFC. (The HomePod is a wi-fi speaker.) But seriously, this thing looks exactly like the HomePod except there mesh grill doesn’t wrap all the way around the speaker. The Sony speaker will cost just $200 for its October release, while the HomePod is $350 and won’t ship until December. Nobody’s blaming Sony for jumping into the wireless earbud and smart speaker market. They’re both relatively new product categories, and everybody wants a piece of the action. In fact, the fact that Apple’s two newest products are a set of wireless earbuds and a smart speaker show that even the pickiest tech companies think they can make a few bucks selling these gadgets. Who knows if Sony’s products will be better than Apple’s. Aside from the HomePods, they’ll all be hitting the market this holiday season. Here at Gizmodo we love to test products against each other so you can look forward to some comparisons in the near future. Meantime, everybody freak out about wireless earbuds and smart speakers if you’re not already doing it!